Nigel Farage is no stranger to playing loose and fast with the truth. Just recently, Mr. Farage held up a sign with what he claims is a quote from the EU article 50 in LBC’s radio studio. 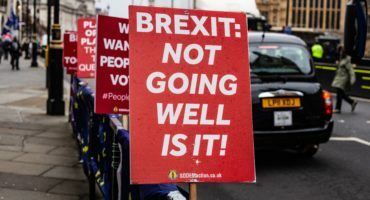 The rights and obligations deriving from the Treaties would therefore extinguish, at least to the extent agreed between the EU and the withdrawing state. Article 50, the actual version, goes like this “the Union shall negotiate and conclude an agreement with that State, setting out the arrangements for its withdrawal”. Here's Nigel Farage holding up something that isn't Article 50. 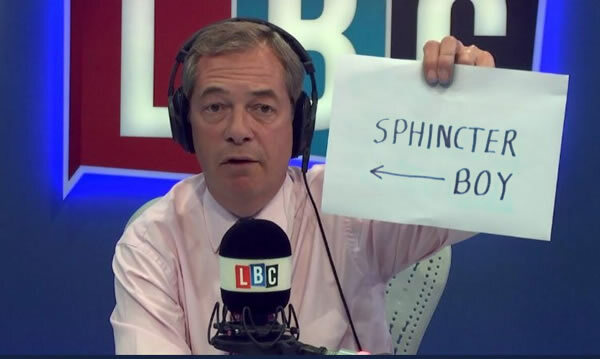 Nigel Farage may be a masterful con man on radio and TV, but he can’t lie on a sign held up in front of a camera without being called out by the internet. Read on for sixteen delicious tweets celebrating Farage’s own goal. Additional examples of Nigel Farage being an asshat are welcome in the comments section below. Not everyone who voted ‘Leave’ is a xenophobic, flag waving cretin, with an over inflated sense of the UK’s importance in the 21st Century, but you’re being tarred with the same brush. The EU is getting stronger as a result of Brexit, looking to reform to prevent the monumental catastrophe that is unfolding in the UK. It has to be the slowest, most protracted suicide in the history of the developed world. We’re basing all our future trade deals on all those nations that we used to rule, where of course their own nationalists will be demanding that they put their own economies ahead of the UK, why trade with 65 Million when you can trade with 500 Million. If your mate decided to drop all his established clients, and try to establish the same, or better deals, with people he’d spent ages ridiculing and treating like second class citizens when he first started his business, you’d say he was mad and get him to reconsider. To do the same thing with an entire country is pure insanity, and you have to ask, who’s paying who to turn a blind eye? I believe in Europe for its cultural and educational benefits but people are indeed being very selfish and just concentrating on the financial aspect. Well in fact if I were to do the same yes I am now financially better off as I am paid in euros. However,I love my country and am saddened by the xenophobia which has grown in UK since the referendum. No he won’t be any worse off but the UK is now thanks to his lunacy which has caused the £ to fall by 20% against the €&$ thus making the whole of the UK that much poorer against the world. Congratulations Brexiteers you have fucked the U.K.! Sadly true. He was several hundred pounds a month better off the day after the referendum. Ironically, he and Paul ‘I was there’ Nuttall may be the only ones better off with Brexit! Brilliant. First decent belly laugh I have had in ages! Don’t stop at 16! Central government banks the world over, be they in the US, the Euro zone, the UK, China, Japan, S. Korea all work very hard to lower the valuation of their currency for a reason. Lower valuation means much better export and trade balance prospects. And 90% of those fake signs makers don’t even know that the UK was not in the Euro zone? What does that tell you?